Here’s something original that I’ve written. It isn’t meant to be read, it is meant to be orated by someone with a strong Yorkshire accent – Me. If all goes to plan, I will be doing that very thing at this moment in time in church. Hope you like it. Hang on, I should really start at the beginning of all this and let you see for your self what I mean. My name is Matthias. Not many people know what my name is. Not many people speak with me for long enough to ask. If they do take time over it they usually speak at me rather than to me. You see my job is mainly to do exactly as I’m told, when I’m told. If that doesn’t happen I’m in big trouble. My job is to work up at the big house. The work isn’t too bad as long as I keep at it and don’t slack off. I have to start early in the morning and usually have to work late into the evening but I enjoy my work. It is my job to ensure the smooth running of the house. The master is a fair man and I make sure that his house is clean. He has things to do and I ensure that the family are well fed. They call me a slave but it isn’t as bad as it sounds. Mostly I work in the house and make sure everything runs smoothly. Well that is how it has been until recently. Things all changed when the master came and told me that he had just announced the engagement of his daughter. He was not acting like himself, he seemed so happy. He spent a great deal of time talking to me that afternoon and not just the usual instructions. He even asked about my family. It was the first time and the last time he has ever shown any interest in my life. He was so keen to show the rest of the town just how much he could spend on his daughters wedding. After all a hefty dowry was being paid and he wanted to show them all that she was worth it. His plans were grand but it all rested on me to make them happen on the day. Obviously there are others up at the house who helped with the onerous task but the organisation was down to me. Of course the closer to the event the worse it has been. I have spent most of the last week fetching and carrying. I’ve only managed to catch a couple of hours sleep – I’m so tired. I had to make sure that everything was ready and the wedding would go off without a hitch. Of course the last few days have been nearly unbearable. As the day has drawn nearer people have been getting more and more stressed and began barking orders at me. I had to bite my tongue just to get through it but finally we made it to the wedding without a falling out. The work of a slave is never done, there is always something that needs fetching, carrying, cooking or cleaning. As the evening progressed everything was looking fantastic. The wine kept flowing and everyone kept laughing and dancing. It was good to see that all of the hard work I had put in was going to pay off. The event was going off without a hitch which was a good job as it was my neck on the block if anything went wrong. And how it was going to go wrong! As the evening wore on there was a problem that is even now still a mystery to me. I had made most of the preparations for this and I bought the wine. I had strict instructions to buy enough for two hundred guests to have as much as they want and that is what I did. It wasn’t the best of wines but it was by no means the worst either. You wouldn’t give it to the emperor if he came round for dinner but lets face it, he wouldn’t be coming. I know that I told them to bring enough! Here we were half way through the evening and we were running out. If I am honest with you I was about to find somewhere to hide. This was about to be the most embarrassing moment for the master, running out of wine on this day when he was so proud. No-one would forget the wedding they went to that ran out of wine. I was so sure but what if I was so tired I made a mistake? I knew that he would punish me either way as all he would care about is that he told me to sort it. As all this is racing through my head there was a bit of a commotion in the corner of the room. I’m not quite sure what happened as I was observing from a little way away so this will be a little sketchy. I didn’t really know who these people were but I recognised some of them. I think they were from Nazareth which is a few hours walk away and it isn’t the sort of journey you make every day. Suddenly the man and woman start being quite curt with each other. It is all in hushed tones but you can tell from the way they are looking at each other that she is being quite insistent. With all this going on at the same time as the crisis I am having over the wine I was a little panicked to say the least. Being summoned over to this furore was an added complication that I didn’t need. I walk up there expecting harsh words to be spoken to me in front of everyone. At the least I was expecting the master at any minute to publicly shame me for my mistake so that he can save face with his guests. The funny thing is it didn’t happen. The woman just tells me to do whatever this other guy says. I was astounded to say the least. His instructions were the strangest thing I’ve seen. He says to me “fill the jars with water”. I’ve never been of the most religious persuasion but it didn’t seem to be the most appropriate time to be worrying about ritual purity. I tried to explain this to him but he was quite insistent that I do it. I got help from the others and we kept our heads down. It took us half an hour to do it too. Somehow we managed to get 180 gallons of water from the well and into the room without disturbing everyone. We used every bucket we could find and filled those great stone jars to the top. We were stunned. No-one knew what had happened apart from the group from Nazareth and the servants who helped to collect the water with me. We had to check it for ourselves to make sure. Back across the room to the stone jars and sure enough, filled to the brim with wine! Everyone was sat enjoying themselves as though nothing out of the ordinary had taken place. The day continues without a hitch and the master is saved from being shamed in front of the whole town. For my part, I am saved from being punished for my mistake. And all because of this young guy from Nazareth. If I was in your shoes I too would be cynically thinking that it was a trick. I have seen some charlatans over the years and this sounds pretty far-fetched. Recently we have had lots of people in the streets performing ‘miraculous deeds’ and trying to take your money. 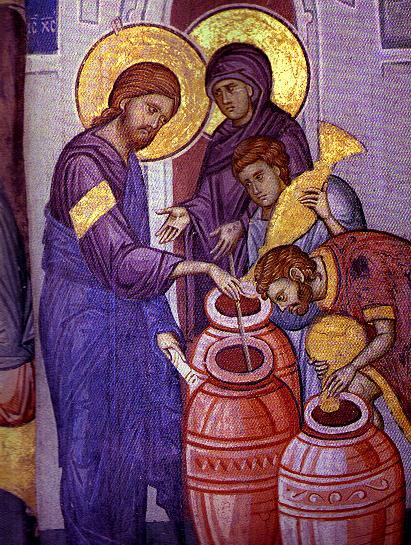 I know that we filled those jars with water from the well. He didn’t ask for anything or make a big show out of what he had done here that evening. He didn’t even go and touch the jars so most guests were oblivious to what he has done. I still don’t really know who he is. He is just some guy from Nazareth. I haven’t got a recording unfortunately.